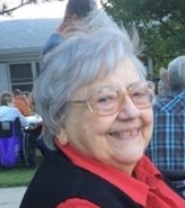 Phyllis Elsie (Gillett) Osborn was born on March 19, 1929 and went to be with her Lord and Savior on January 15, 2019. When she was born on March 19th, she was dubbed “the little mud-bound baby.” The night before her parents discussed going to town but decided it was too muddy. But the young lady was determined to arrive, so her father called the doctor who talked him through the delivery, step by step. It was two weeks before her parents were able to take her to town to see the doctor. At five years old, Phyllis began to go to school at District #61. She received all her elementary education in Sioux County in Districts 61, 29, and 51. She loved school. Reading was one of her favorite pastimes and doing crossword puzzles. As a young girl, one year they had the measles. At that time her father purchased, with the older children’s sheep and wool money, a second-hand phonograph and a box of records for 25cents. A week or so before her death, Phyllis was asking the family if they knew where the phonograph was. The phonograph helped develop her love for music. She especially liked to sing. Phyllis attended high school at her father’s alma mater, Chadron prep, a part of Chadron State college. She graduated in 1948. She received her Bachelor of Science degree in music education for Chadron State College in 1969. During her life she taught school for several years in the public schools and the Chadron Christian School. Phyllis married Orlando S. Osborn. They lived many years in the Nebraska Sandhills where he worked as a ranch hand and she was sometimes a ranch cook. They had two sons, Kenneth B. and Charles E. In 1958, they moved back to Sioux County where she taught the Grote School and Landy worked as a ranch hand for Bruce Parsons. After Landy passed away in August of 2008, she missed him everyday. In 1965, they moved to Harrison and in the spring of 1966, they moved to Chadron where they purchased their home in 1967. For many years she sold Tupperware and enjoyed meeting many women at the parties. Phyllis’s greatest love was her family. Phyllis was preceded in death by her parents, Rowland and Harriet Gillett, her husband Orlando Osborn, her brothers, Eston, Quentin, and LaVern, her sister Willa, sister-in-law Lorraine, and six nieces and nephews. Leaving to mourn her passing are her sons, Ken of Georgetown, TX, and Charles (Myra) of Elgin, TX; grandchildren, Christie (Don) Snyder, Fort Worth, TX, Colton, Mason, and Autumn; Deann (Bramwell) Shamuyarira Conroe, TX, and son Israel; Tonya (David) Beaudet, Plano, TX, Kayli, Evan, Eli, Noah, brothers, Bob (Linda) Gillett of Ashland, NE, Terry (Phyllis) Gillett of Harrison, NE, Don (Shirley) Gillett of Fremont, NE, and Clarence (Twila) of Lincoln, NE; sisters Vivian Foley of Cheyenne, WY, Norie (Rich) Davis of Belgrade, MT, Arline (Bill) Lyons of Crystal, MN, Beth Spencer of Hastings, Nebraska, and numerous nieces and nephews. A memorial has been established for the Kenwood Baptist Church. Donations may be sent to Phyllis Gillett, PO Box 356, Harrison, NE 69346.